There are many diverse types of batteries you can use in conjunction with a home solar power system. 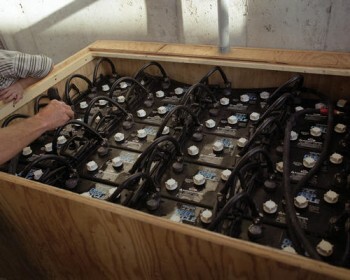 All batteries rely on chemical reactions to convert stored chemical energy to electrical energy. The 4 types of battery suitable for solar use are described and contrasted below. Lead acid batteries are the most common type of batteries in automobiles. This type of battery relies on the conversion of lead and lead dioxide in a sulfuric acid solution to lead sulfite to release electrons. This reaction can be reversed to recharge the batteries. Pores in the lead and lead dioxide plates allow greater surface area for the energy-providing reaction, allowing sudden bursts of high current. Although lead acid batteries are less efficient than other forms, they are preferred because they can provide the high amount of current in a short amount of time needed to start a car. In contrast, lead acid deep cycle batteries are designed to have a large amount of their stored power discharged between charging sessions. Their plates are non-porous to allow the battery to withstand deep cycles (up to 80% discharging). RV marine batteries often do not last as long as other deep cycle batteries. However, they are small and compact, which makes them easy to handle and install. They often come “sealed,” which makes them safer to use indoors. Unfortunately, sealed batteries are sensitive to overcharging, which may shorten their lifespan. These types of batteries are usually 12-volt, and have varying capacities (up to 100-amp hours). To obtain a larger storage capacity, batteries would need to be attached in parallel, which is less efficient than having a single large battery. Golf cart batteries are designed for deep cycles, which give them a longer lifespan and better performance. They are usually lightweight and cheaper per amp hour than RV/marine batteries. They also have the advantage of being less sensitive to overcharging. Because they are generally 6-volt, while most home systems are 12-volt, they will need to be connected in series, which is more complicated than using a single battery. Because they are not sealed, they need to be stored in a well-ventilated area and occasionally be given water. Golf cart batteries have too limited amp-hour capacities for use in a large power system. Industrial or stationary batteries are available in 2-volt units, so the appropriate number of units need to be combined. They have very high amp-hour capacities, but are significantly more expensive than other types of battery and very heavy. Their weight (up to 350 pounds per 2-volt cell) will often require special storage and transportation. Among all, the electric golf cart batteries are the most suitable for home energy system because of its cost and practicality. Nickel batteries use nickel alloy plates (nickel cadmium or nickel iron) instead of lead plates. Unlike lead-acid batteries, these plates are stored in an alkaline (basic) instead of an acidic solution. While excellent for home power use, the cost is significantly higher than that of lead acid batteries. Nickel allow batteries can last up to fifty years, and require less maintenance, as they can be fully discharged without damage. Unfortunately nickel alloy batteries are more difficult to dispose of than lead-acid batteries. The program was specially created to teach you step by step how to construct a solar array on a shoestring budget. The instructions are in PDF files and also High Definition (HD) video recordings. Click on the link below and visit Green DIY Energy right now.